Your home: set in stone. Indoor and outdoor stone masonry accentuates your home and garden. We consider our stonework an art, handcrafted to the style of your choosing. Enjoy a custom and timeless look from the comfort of your home. Stone floors, fireplace exteriors, and interior stone walls bring the grandeur of nature inside your home using earth’s sturdiest building block. Choose from a variety of styles we do well including brick, fieldstone, and granite. Cracks, replacements, and repairs of indoor stonework are handled with care, maintaining the original integrity of the work. Maintain the integrity of your stonework. Over time, mortar joints holding together indoor and outdoor stonework can fail, allowing moisture to seep through and accelerate damage. Consider our stone restoration services, for example, repointing mortar joints to prevent compromising structural integrity and appearance. Each of our masons have over 15 years experience so you can trust the job will come out right. Winter is a great time to repoint a stone basement foundation, keeping heat in and moisture out, especially before heavy Spring rains. Prevent erosion, level off and terrace areas of your property. Our crew has the experience and equipment to build exquisite and architectural walls. We engineer our walls to stand the test of time. Contact us on the different types of stone available . This gives your soil structure while looking attractive and allowing drainage on your well-landscaped property. Choose the stone that complements your garden, home and surrounding environment. Beautiful on the interior, safe and strong at the exterior. Stone staircases complement the architecture and design of your home. Outdoors, stone steps will weather well and keep strong, plus will hold traction in slippery, icy, winter months. Stone staircases can hold dual purposes as well, serving as a retaining wall for your terrain or pathway through your garden. Picturesque, organized, private and secure. 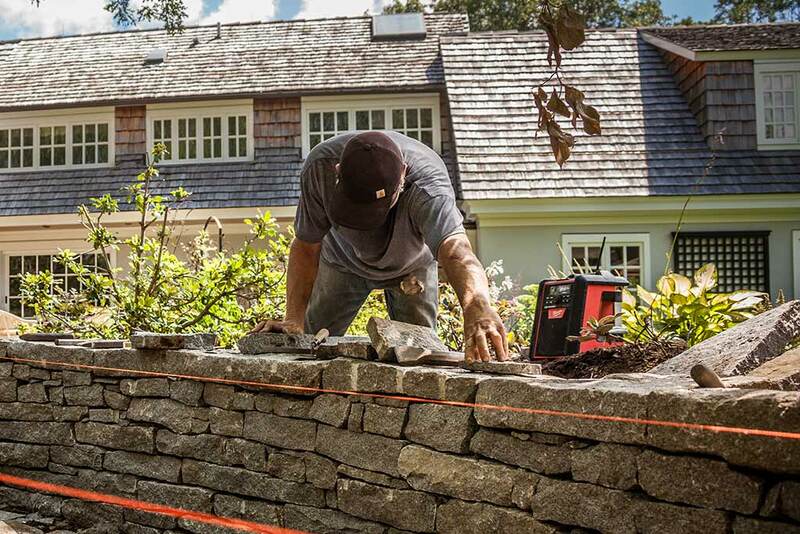 Economically and architecturally robust, stone walls have been the choice for landscaping for centuries. A stone wall can be as multipurpose as you and your property, built as a garden retainer, fence and privacy, or land divider. The resilience, strength, and quality of stone is unmatched in any other material. Crafted by hand to fit your space, rest assured that your patio will be the life of the party and remain safe for your whole family. Stone crafted to match your aesthetic and your lifestyle, a full plan for your outdoor space can be designed with outdoor stone kitchens and walls for privacy. Barbeques, sunbathing, and even late fall bonfires set on the perfect stage. Create the ideal experience for walking through your personal sanctuary with a stone walkway. Avoid unnecessary wear on your lawn by providing the pathways to navigate your beautiful garden. In winter months, stone pathways will be easy to clear and remain safe through ice and cold.